While Sunday's match between Manchester United and Liverpool failed to provide the entertainment many had hoped for, the goalless draw did produce one notable statistic. 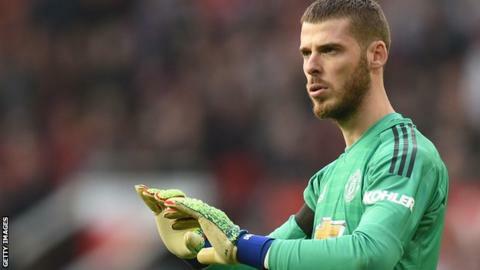 Liverpool's failure to net at Old Trafford meant United keeper David de Gea earned his 100th clean sheet in the Premier League. De Gea is only the seventh goalkeeper to reach a century of clean sheets with one Premier League club and becomes the second United keeper - after Peter Schmeichel - to achieve the feat. However, what is perhaps more surprising is the 28-year-old Spaniard - playing in his eighth season in the Premier League and for one of its biggest clubs - is still outside the top 15 keepers when it comes to all-time blanks. De Gea still has an outside chance of surpassing former Sunderland, Aston Villa and Stoke keeper Thomas Sorensen (107), plus ex-Bolton, West Ham and Wigan stopper Jussi Jaaskelainen (108), before the end of this season. But with an average of keeping a clean sheet every 2.64 games - and United's patchy defensive record - that looks highly unlikely with only 11 league matches left this season. Continuing at that rate of 100 clean sheets in 264 league games means he would have to play another 272 top-flight matches, which would take at least another eight seasons, to surpass Arsenal and former Chelsea keeper Petr Cech's all-time record. Leicester City decided it was time to sack manager Claude Puel on Sunday - a decision some Foxes fans believed was a long time coming. Probably not least because they were sick of seeing their team go behind. Puel's side conceded the first goal in 19 of their 27 Premier League games under the Frenchman this season - more than any other team. That gave them an uphill task and, even though they recovered 13 points from losing positions, the statistics make for grim reading: Leicester have lost 13 of the games in which they have trailed. They also lost 3-1 at Arsenal in October after going ahead. Only three of the bottom four sides - Huddersfield, Fulham and Cardiff - have a worse record when it comes to turning around deficits. Barcelona forward Lionel Messi scored his 50th career hat-trick on Saturday, after netting his first in a 3-3 draw against Real Madrid in March 2007. The Argentine's treble against Sevilla was his 32nd in La Liga - meaning no Premier League club has scored more hat-tricks in the past 12 years than he has. In fact, Messi's tally is almost a quarter of the 144 hat-tricks scored in the entire Premier League in the same period. There are no Premier League players who have scored even a third of his league tally of trebles in that period. Argentina team-mate - and close friend - Sergio Aguero is the nearest with 11. Newcastle United could have been forgiven for not having many ideas about how to break down 10 men during Saturday's game against Huddersfield Town. That was because, until Town skipper Tommy Smith was shown a red card for a lunge on Miguel Almiron, they had not played against 10 men in the Premier League for more than FIVE years! Smith was the first player to be sent off against Newcastle since Norwich's Bradley Johnson in January 2014 - a run spanning 155 games. Nevertheless, it did not take Rafael Benitez's side too much to figure it out. The Magpies, who played with a numerical advantage for more than 70 minutes, ran out 2-0 winners in a comfortable performance. Can Joshua become the Premier League's King of Norway? Bournemouth's Joshua King tucked away a first-half penalty in his side's 1-1 draw against Wolves, making him the outright third top-scoring Norwegian in Premier League history. That was the 27-year-old forward's 39th goal in the English top flight - and he would have moved joint second had he converted another spot-kick in the second half. Do you know which two players lead the way? And can you remember which other Norwegians also made an impact in the English top flight? Can you name the 10 leading Norwegian scorers in Premier League history? New Huddersfield head coach Jan Siewert has not quite had the instant impact he might have hoped for. The 36-year-old German saw his side go down 2-0 at Newcastle on Saturday, meaning he has lost all four matches since replacing compatriot David Wagner last month. That means he is the 11th manager to lose his opening four Premier League matches in charge and the first since Dutchman Frank de Boer at Crystal Palace last season. How many games was initial losing run? How many PL games did they manage?